New Flash: Chevron purchases high resolution 31P NMR system for at-line analysis of a phosphoric acid catalyzed alkylation process. The Chevron Richmond Refinery needed a simple and quick measurement of phosphoric acid strength and quality. Prior analysis procedures included transporting samples several miles from the refinery process to the technical center in order to perform the 31P NMR analysis on a high field superconducting NMR system. This process was also complicated by the fact that the process operators were not able to perform the analyses on the conventional high field NMR systems (400 MHz for 1H, 161 MHz for 31P) themselves, but had to wait for NMR technician and instrument availability. If sample analyses was required after research facility working hours the NMR lab technicians were required to come in and run the NMR for the process operators. A simple permanent magnet bench-top NMR system has now been placed in the existing process lab adjacent to the process unit control room. The NMR samples are placed in specially designed 9 mm (diameter) x 50 mm (length) sample tubes in order to accommodate sample handling issues (high viscosity sample with no solvents being added) and are place easily into the NMR probe. Sample preparation is essentially non-existent and sample waste is minimal. The 31P NMR analysis itself takes around 3 minutes to perform. The “at-line” NMR system is a high resolution Qualion permanent magnet system operating at 58.3 MHz for 1H and 24.2 MHz for 31P. The system is located on a lab bench in the process lab building. Some examples of the system performance are shown along with the comparison with high field NMR results. It can be seen that the lower field instrument provides more than adequate resolution to perform the acid strength analysis. Figures 1 and 2 show quantitative 31P NMR spectra of different phosphoric acid concentrations dissolved in water. The NMR analysis is found to be fully quantitative. 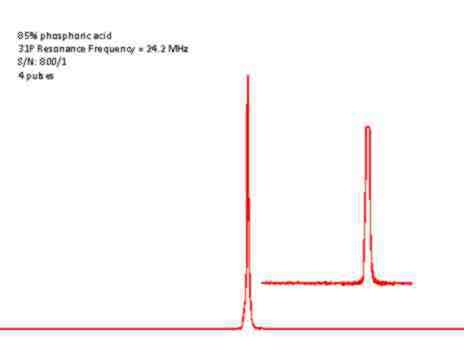 Figure 2: 31P NMR signal acquired at 24.2 MHz on several concentrations of phosphoric acid in water. Figure 3 shows the 31P NMR data obtained at 7 Tesla (121 MHz) and 1.4 Tesla (24.2 MHz) of actual process samples. The peak at 0 ppm corresponds to orthophosphoric acid, the peak at -15 ppm corresponds to the terminal P atoms of a polyphosphoric acid chain, and the peak at -30 ppm corresponds to internal P atoms in the middle of polyphosphoric acid chains. Relative areas of these peaks are used to calculate the acid strength. Figure 5: Another comparison of 7 Tesla laboratory acquired NMR data compared to rapid at-line 1.4 Tesla NMR assay of phosphoric acid strength. The NMR system being utilized at the Chevron Richmond refinery is a Qualion 60 MHz NMR system utilizing a 31P probe.